What inspires you? It’s a simple question really. What gets your creative juices flowing? What enables you to express yourself in such a way that makes your medium yours? It could be tiny idiosyncrasies in your writing style. It could be the way you draw certain body parts better than others, it could even be what certain brand of humor you love to use. But why do you like that style so much, what inspired you to do the things you do the way you do them? In Comic Books right now Marvel and DC are in a dog fight with who can keep their fan bases from jumping ship to the other, and what looks like a “Reboot War” with some of the most famous titles in comic book history. Marvel with Marvel Now and DC with the New 52 have rebranded and recultivated many classic books we came to know and love. But what made they do this? Were they just sick of it and had enough? What made the 2 biggest comic book publishers around decided to reboot everything? The success of their Movie Franchises played a giant pivotal role in the creation of the Marvel Now and the New 52 to try to give a fresh new look to the comics that were getting up there in numbers. Most of these characters have been going through the motions for both companies for almost 50 years with nothing really that fresh to come along. All of a sudden Nolan’s Batverse and the Marvel Movie Universe and the Spider-Man franchises exploded with popularity and they were not cannon to the least bit, but all printing money for each company none the less. So Marvel and DC both decided to freshen up their classic heroes and villains and use very creative means to do so. They were influenced heavily by the newness of the movie Universes and that is not a bad thing. 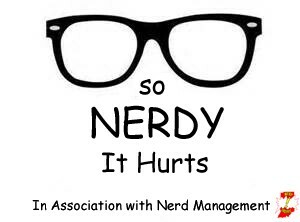 Creativity comes into play quite a bit and the topic was discussed in length by the crew of Nerd Management on their episode 19 podcast which I guest starred on this Thursday. We discussed many different ways we are directly influenced in our creativity and how the Nerd Management crew is so diverse yet pulled together by a common bond of Nerdiness. We draw creativity from one another and I think that helps quite a bit. Whether it is Alec with his writing, Warner and Chris with their Band, Tiffany and Justin with their cooking, myself with my blog we draw off everything around us to be the type of creative that helps us move along! So don’t forget Nerd Management is not just about comic books, movies, and games… It’s about being Nerdy in any way and being proud of it, because you can draw creativity from everywhere and when you put that to use in your medium well that makes you a type of Nerd and welcome to the family. If It Doesn’t Say Micro, Then Its Not the Real Thing! I have been collecting things my whole life from Ball Cards to Action Figures. No matter what I am collecting the thrill of the hunt is always there. I wonder if I buy one more package of football cards I will get a Barry Sanders? I wonder if I go to Toys R Us today the new GI Joes will be out? If I go to the Antique Store on my way home, I wonder if they will have any more old “Coke” bottles? I can’t wait for Wednesday, the new comic books come out! Collecting is fun for me because now that I am 30 it reminds me of the young me that all he wanted was to get all of the NFL football helmets out the quarter vending machines outside of IGA; or trying to get as many Micro Machines as I could to fit into an old briefcase my grandfather gave me for my birthday one year. It doesn’t matter what I am collecting it is fun. Currently on the docket it is Teenage Mutant Ninja Turtles and Football cards for my son to have when he is a little older. I am excited for the day I can hand this stuff to him and let him start collecting on his own. He has built a small collection of Fisher Price Zoo Talkers and Juice Bottle Tops from Tummy Tippers. Along the year’s most of my collections fell by the wayside or I had to sell them for various import reasons. Each time a little bit of my heart was left behind and a tiny part of myself was gone. I know that sounds intense but collecting transcends many different psychological tendencies for many people. Compulsions to collect and obtain and sometimes at obsessive rates. Attachments to inanimate objects and more studies have been done on the idea of collecting. Some impressive collections I have or have had in my life that I am very proud of are my 1500 Jeff Bagwell baseball cards. 880 of those are different and the rest are doubles and triples. I have 36 Barry Sanders cards with 2 rookies, one of which being the rare ROY Hawaii card. I currently have all of the new Teenage Mutant Ninja Turtles line. Also I have quite a few Peyton Mannings and Andrew Luck cards that will go to my son when he is old enough to keep them. I have also lost some gems. The one I miss the most is my every appearance of Deadpool starting from my collecting his 1st appearance and every single one after up until 2008. I had to sell them a little bit after that, and I may never get over that. Over 250 Actions figures have left through my eBay account as well. Comic Book University formerly Downtown Comics South for those of you who hadn’t been there for a couple of years; has moved to South Shelby Street on the South Side of Indianapolis in the shopping center on US 31 S next to Garden Ridge. The new location is the perfect spot for Gaming and events such as Friday Night Magic, Hero Clix Tournaments, and Signings by Authors and Artists. The new location has plenty of room for everything that Comic Book University has to offer. There are aisles of Action Figures, there is a section for Gaming, an entire wall of trades, and so many back issue comics its breathtaking. Rob and Dair will greet you at the door, and if you are a regular they have already pulled your comics and put them away for you. If you aren’t a regular or if you are new, then don’t hesitate to talk to them. They love to chat it up. The store will be having a Grand Opening around the 1st of February and they will be super busy this coming Christmas. So if you need any gift Ideas for the Nerd in your family then head on over to Comic Book University and make some friends. There are 2 auxiliary rooms for Gaming, and the future potential home of the Podcast Nerd Management. They are large and have plenty of room for Friday Night Magic and Her Clix events. There are plenty of restaurants around and if you are driving a long distance to get there, you will have plenty to do, since CBU is so large and there is so much to take in. So if you are looking for a new Comic Book shop, or you are a regular to Comic Book University stop on by the new location and see what all of the fuss is about. Sunday Preview: Comic Book University’s New Venue and THOR 2!!!! Busy week ahead!!! (Toot Toot) A bunch of good comics come out, so make sure you stop by Comic Book University this Wednesday to grab them in their New Location!!!! That’s right Comic Book University has moved over to US 31 on the South Side of Indianapolis behind Moe’s Southwestern Grill and next to United Art’s and Education! This is a great location for Rob and the guys since now they have enough room to host gaming events and special events such as Friday Night Magic every Friday Night at Comic Book University!!! It could not have happened to a better comic book store and like the Dean says, Class is in Session! This week some books to look out for are Longshot Save the Marvel Universe #1 and Cataclysm: The Ultimates Last Stand #1 from Marvel and Forever Evil #3 and Swamp Thing #25 by DC comics. All 4 of these issues are sure to get your juices flowing and get you excited about the new venue to get your books. This Thursday or Thorsday is the midnight premiers of Thor: The Dark World. Yes, it is finally here!!! The most anticipated Phase 2 movie from Marvel to date has finally arrived and it will be great if you see it in 2D or 3D. Don’t forget it you see it in 3D you get the first 5 Minutes of the Captain America: Winter Soldier movie.